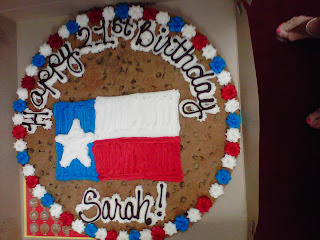 A cookie cake that my co-workers got me. They are so sweet. I praise God the 21 years of life I have been given and the three years he has blessed me with this blog. My Destiny had taken many turns during the past three years. I have new friends (many thanks to this blog), a stronger faith, a published book, and much more. Happy, happy, happy birthday! I am so blessed to know such an intuitive, talented, godly, and sparkling young woman and count her as a dear, dear friend! :) I love you bunches and bushels! Praying that God would rain down blessings upon your special day (and on the fabulous year to come!). Cookie cake, my favorite, yum! Oh, I think I accidentally left two comments. Oh, well!